The Aldabra giant tortoise (Aldabrachelys gigantea), from the islands of the Aldabra Atoll in the Seychelles, is one of the largest tortoises in the world. Historically, giant tortoises were on many of the western Indian Ocean islands, as well as Madagascar, and the fossil record indicates giant tortoises once occurred on every continent and many islands with the exception of Australia and Antarctica. Many of the Indian Ocean species were thought to be driven to extinction by over-exploitation by European sailors, and they were all seemingly extinct by 1840 with the exception of the Aldabran giant tortoise on the island atoll of Aldabra. Although some remnant individuals of A. g. hololissa and A. g. arnoldi may remain in captivity, in recent times, these have all been reduced as subspecies of A. g. gigantea. (video) A pair of Aldabra giant tortoises at Tobu Zoo in Saitama, Japan. 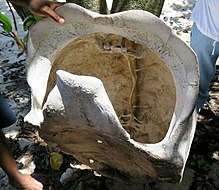 A skeleton of Aldabra giant tortoise found in Cousin Island (Seychelles). The carapace is a brown or tan color with a high, domed shape. It has stocky, heavily scaled legs to support its heavy body. The neck of the Aldabra giant tortoise is very long, even for its great size, which helps the animal to exploit tree branches up to a meter from the ground as a food source. Similar in size to the famous Galápagos giant tortoise, its carapace averages 122 cm (48 in) in length with an average weight of 250 kg (550 lb). Females are generally smaller than males, with average specimens measuring 91 cm (36 in) in length and weighing 159 kg (351 lb). Medium-sized specimens in captivity were reported as 70 to 110 kg (150 to 240 lb) in body mass. Another study found body masses of up to 132 kg (291 lb) most commonplace. This species is widely referred to as Aldabrachelys gigantea, but in recent times, attempts were made to use the name Dipsochelys as Dipsochelys dussumieri, but after a debate that lasted two years with many submissions, the ICZN eventually decided to conserve the name Testudo gigantea over this recently used name (ICZN 2013) this also affected the genus name for the species, establishing Aldabrachelys gigantea as nomen protectum. The main population of the Aldabra giant tortoise resides on the islands of the Aldabra Atoll in the Seychelles. The atoll has been protected from human influence and is home to some 100,000 giant tortoises, the world's largest population of the animal. Smaller populations of A. gigantea in the Seychelles exist in the Sainte Anne Marine National Park (e.g. Moyenne Island)., and on La Digue, where they are a popular tourist attraction. Another isolated population of the species resides on the island of Changuu, near Zanzibar, and other captive populations exist in conservation parks in Mauritius and Rodrigues. The tortoises exploit many different kinds of habitat, including grasslands, low scrub, mangrove swamps, and coastal dunes. A peculiar habitat has coevolved due to the grazing pressures of the tortoises: "tortoise turf", a comingling of 20+ species of grasses and herbs. Many of these distinct plants are naturally dwarfed and grow their seeds not from the tops of the plants, but closer to the ground to avoid the tortoises' close-cropping jaws. As the largest animal in its environment, the Aldabra tortoise performs a role similar to that of the elephant. Their vigorous search for food fells trees and creates pathways used by other animals. Primarily herbivores, Aldabra giant tortoises eat grasses, leaves, and woody plant stems. They occasionally indulge in small invertebrates and carrion, even eating the bodies of other dead tortoises. In captivity, Aldabra giant tortoises are known to consume fruits such as apples and bananas, as well as compressed vegetable pellets. Little fresh water is available for drinking in the tortoises' natural habitat, so they obtain most of their moisture from their food. The Aldabra tortoise has two main varieties of shells. Specimens living in habitats with food available primarily on the ground have more dome-shaped shells with the front extending downward over the neck. Those living in an environment with food available higher above the ground have more flattened top shells with the front raised to allow the neck to extend upward freely. Aldabra tortoises are found both individually and in herds, which tend to gather mostly on open grasslands. They are most active in the mornings, when they spend time browsing for food. They dig underground burrows or rest in swamps to keep cool during the heat of the day. While they are characteristically slow and cautious, they are capable of appreciable speed. They are also known to attempt perilous acrobatic feats, rising precariously on their hind legs to reach low branches. They risk death by tipping onto their backs and being unable to right themselves. This unusual behavior led Mexican biologist José Antonio de Alzate y Ramírez to refer to the Aldabra as the "ninjas" of the tortoise world. Large tortoises are among the longest-lived animals. Some individual Aldabra giant tortoises are thought to be over 200 years of age, but this is difficult to verify because they tend to outlive their human observers. Adwaita was reputedly one of four brought by British seamen from the Seychelles Islands as gifts to Robert Clive of the British East India Company in the 18th century, and came to Calcutta Zoo in 1875. At his death in March 2006 at the Kolkata (formerly Calcutta) Zoo in India, Adwaita is reputed to have reached the longest ever measured lifespan of 255 years (birth year 1750). Today, Jonathan, a Seychelles giant tortoise (A. g. hololissa), is thought to be the oldest living giant tortoise at the age of 187 years  and Esmeralda is second at the age of 175 years, since the death of Harriet at 176, a Galapagos giant tortoise. Esmeralda is an Aldabra giant tortoise. Between February and May, females lay between 9 and 25 rubbery eggs in a shallow, dry nest. Usually, less than half of the eggs are fertile. Females can produce multiple clutches of eggs in a year. After incubating for about eight months, the tiny, independent young hatch between October and December. In captivity, oviposition dates vary. Tulsa Zoo maintains a small herd of Aldabra tortoises and they have reproduced several times since 1999. One female typically lays eggs in November and again in January, providing the weather is warm enough to go outside for laying. The zoo also incubates their eggs artificially, keeping two separate incubators at 27 °C (81 °F) and 30 °C (86 °F). On average, the eggs kept at the latter temperature hatch in 107 days. The Aldabra giant tortoise has an unusually long history of organized conservation. Albert Gunther of the British Museum, who later moved to the Natural History Museum of London (enlisting Charles Darwin and other famous scientists to help him) worked with the government of Mauritius to establish a preserve at the end of the 19th century. The related, but distinct, species of giant tortoise from the Seychelles islands (Seychelles giant tortoise A. g. hololissa and Arnold's giant tortoise A. g. arnoldi) are the subject of a captive-breeding and reintroduction program by the Nature Protection Trust of Seychelles. ^ Tortoise & Freshwater Turtle Specialist Group (1996). "Geochelone gigantea". The IUCN Red List of Threatened Species. IUCN. 1996: e.T9010A12949962. doi:10.2305/IUCN.UK.1996.RLTS.T9010A12949962.en. Retrieved 26 December 2017. ^ a b Schweigger, Augustus F. 1812. Prodromus monographiae Cheloniorum. Königsberger Archiv für Naturwissenschaft und Mathematik 1:271–368, 406–462. ^ a b Duméril, André Marie Constant, and Bibron, Gabriel. 1835. Erpétologie Générale ou Histoire Naturelle Complète des Reptiles. Tome Second. Paris: Roret, 680 pp. ^ a b Günther, Albert C.L.G. 1877. The Gigantic Land-Tortoises (Living and Extinct) in the Collection of the British Museum. London: Taylor and Francis, 96 pp. ^ a b c d Turtle Taxonomy Working Group [van Dijk, P.P., Iverson, J.B., Rhodin, A.G.J., Shaffer, H.B., and Bour, R.]. 2014. Turtles of the world, 7th edition: annotated checklist of taxonomy, synonymy, distribution with maps, and conservation status. In: Rhodin, A.G.J., Pritchard, P.C.H., van Dijk, P.P., Saumure, R.A., Buhlmann, K.A., Iverson, J.B., and Mittermeier, R.A. (Eds.). Conservation Biology of Freshwater Turtles and Tortoises: A Compilation Project of the IUCN/SSC Tortoise and Freshwater Turtle Specialist Group. Chelonian Research Monographs 5(7):000.329–479, doi:10.3854/ crm.5.000.checklist.v7.2014. ^ Pritchard, Peter C.H. Encyclopedia of Turtles. Neptune, New Jersey: T.F.H. Publications, Inc. Ltd., 1979. ^ "ANIMAL BYTES – Aldabra Tortoise". Seaworld.org. ^ Hansen, D. M., Kaiser, C. N., & Müller, C. B. (2008). Seed dispersal and establishment of endangered plants on oceanic islands: the Janzen-Connell model, and the use of ecological analogues. PLoS One, 3(5), e2111. ^ Hughes, G. M., Gaymer, R., MOORE, M., & Woakes, A. J. (1971). Respiratory exchange and body size in the Aldabra giant tortoise. Journal of Experimental Biology, 55(3), 651-665. ^ International Commission on Zoological Nomenclature [ICZN]. 2013. Opinion 2316 (Case 3463). Testudo gigantea Schweigger, 1812 (currently Geochelone (Aldabrachelys) gigantea; Reptilia, Testudines): usage of the specific name conserved by maintenance of a designated neotype, and suppression of Testudo dussumieri Gray, 1831 (currently Dipsochelys dussumieri). Bulletin of Zoological Nomenclature 70(1):61–65. ^ Bour, Roger (1982). "Contribution à la connaisance des tortues terrestres des Seychelles: définition du genre endémique et description d’une espéce nouvelle probablement originaire des îles grantiques et bord de l’extinction ". Comptes Rendus de l’Académie des Sciences 295: 117–122. (Dipsochelys arnoldi, new species, p. 118). (in French). ^ Payne, Roger (2004-04-05). "Losing Aldabra". Voyage of the Odyssey. PBS. Retrieved 2008-10-21. ^ "Marine Parks: St. Anne". Seychelles National Parks Authority. Archived from the original on 2016-04-16. ^ Grubb, P. The Growth, Ecology and Population Structure of Giant Tortoises on Aldabra. Phil. Trans. Roy. Soc. Lond. B, Vol. 260, 1971, pp. 327–372. ^ BBC News - South Asia (2006-03-23). "'Clive of India's' tortoise dies". BBC News. BBC Online. Retrieved 2014-01-23. ^ ninemsn Pickle. - Australia (2016-03-25). "Tortoise has his first bath in 184 years". Pickle. ninemsn. Archived from the original on 2016-03-27. Retrieved 2016-03-25. ^ Stearns, Brett C. Captive Husbandry and Propagation of the Aldabra Giant Tortoise. Int. Zoo Yb., Vol. 27, 1988, pp. 98–103. ^ Collins, Dave. "Captive Breeding and Management of the Aldabra Tortoise". Presented to 8th International Herpetological Symposium, Jacksonville Zoo, Jacksonville, Fl., 1984. ^ Bourn, D. Reproductive Study of Giant Tortoises on Aldabra. J. Zool., London, Vol. 182, 1977, pp. 27–38. ^ Spratt, David M.J. Operation Curiesue: A Conservation Programme for the Aldabra Giant Tortoise in the Republic of Seychelles. Int. Zoo Yb., Vol. 28, 1989, pp. 66–69. ^ Swingland, Ian R. Aldabran Giant Tortoise. The Conservation Biology of Tortoises, Occasional Papers of the IUCN Species Survival Commission (SSC), No. 5, 1989. Wikimedia Commons has media related to Aldabra Giant Tortoise.